Eid Milad Saa’d to me! Yup, you read that right, today is my birthday. Yippee. Although I don’t technically call it my birthday. I like to think of it as an anniversary. It sounds better when I say I’m celebrating my 29th birthday anniversary then when I say it’s my *mumble mumble* birthday. So I’m sticking with that story. We celebrated by spending the day going to our local farmer’s market so the girls can buy me some beautiful orange flowers and pretty much doing nothing else for the rest of the day. It’s the most perfect way to spend an anniversary really. 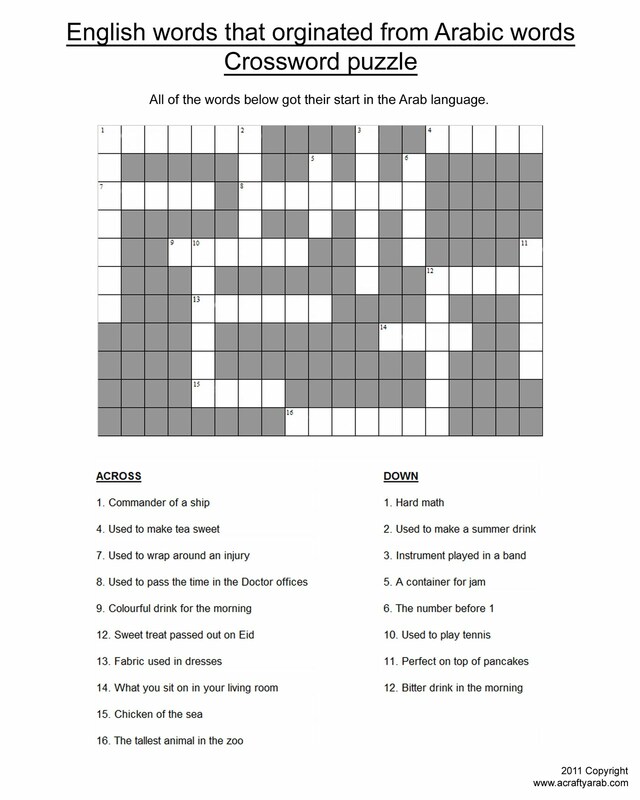 But I don’t want to leave you hanging without anything to do for today’s Ramadan activity, so I’ve created an Arabic Word Crossword Puzzle that I hope will keep your kids’ busy till tomorrow. I’ve taken words that have originated from the Arabic language and found their way into the English language. It’s my first ever crossword puzzle, but I hope to make another soon as it was fun to draw.